Last week I stumbled into a great slide show put together by the Guardian; a history of the iconic London tube map in pictures. 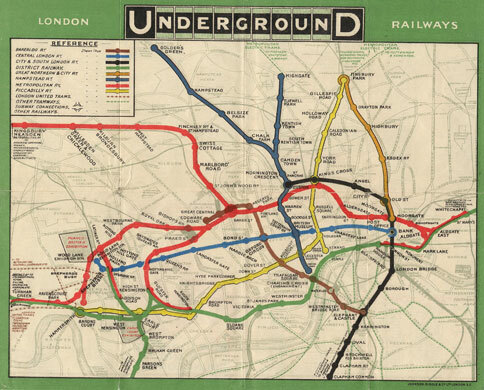 Tube maps have been part of London life since the birth of the Underground, and were initially as confusing as the city itself: a tangle of different lines woven around the curving River Thames. Enter Harry Beck, an LU engineer who in 1931 came up with the radical idea of presenting the ever-expanding network as a circuit diagram rather than a geographical map – so creating a modernist design icon that has never been bettered. But as the Oystercard zone expands, are its days numbered? Take a look back at the changing face of the tube over the last century. Hop on over to the Guardian site to check it out.